Weeding: April showers bring not only May flowers, but weeds too. While your yard is still receiving regular rainfall, pulling weeds is easiest while the ground is wet. Mulching: Loosen your existing mulch by hard raking. Apply fresh mulch. Mulch should be maintained at a depth no less than 1” and no greater than 3”. Be sure to keep mulch away from the trunks of trees & shrubs. 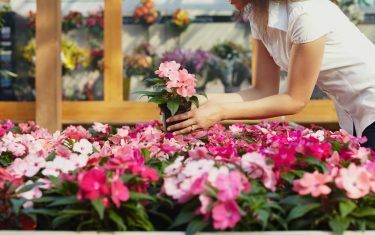 Houseplants: Recently refreshed plants that have remained inside all winter can be placed outside so they can benefit from the natural elements. This is a good time to re-plant. Houseplants flourish in the shade during the growing season. Compost pile: You may compost, but have you thought about the best place in your yard for your pile? An area that both receives shade and might serve as a future location for next season’s planting would qualify. Protection from the sun will improve your compost and rich soil will improve next year’s crop. Plant healthy veggies: Growing your own at home is rewarding a great for your health. You can start small by planting a Patio or Celebrity tomato in a pot, or go big and try a variety of fruits and vegetables in a sunny area of your yard. Frost: Our greenhouse is filled with blooms, which means it’s time to stock up on colorful annuals for your porch pots! Are you ready to thrill, fill, spill, and chill like a professional? We’re happy to share out secrets, and our potting bar too. Herbs: It’s time to break out the grill and try new light, warm weather recipes. Fresh herbs provide that extra flavorful kick we’re all looking for. Herbs are easy to grow in pots as well as the in the garden. Place your potted herbs near the kitchen for easy access. Home-cooked dishes sing with home-grown dashes of flavor from fresh herbs. Bugs: Insects are going to be out and about before the really hot weather drives them off. Keep in mind if you rid your garden of pesky pests, you may also deplete the beneficial bug population. Try organic alternatives, or stop in so we can discuss your options. Prune shrubs: Pruning summer blooming shrubs before the leaves are fully developed allows you to easily see the structure to judge the cuts required. Cut old stems down by 1/3 to 1/2 – into the shrub interior – to promote branching & increase fullness. Prune flowering shrubs during the proper season. The basic rule to follow to determine this is by the flowering time. Usually plants that flower early in the spring (Lilac, Forsythia, Viburnum or Azalea) develop next years’ buds on growth during the current summer. Prune these as needed immediately after flowering to allow bud development for the next year. Shrubs that flower in the summer (Hydrangea, summer-flowering Spirea & Roses) develop their buds on the current year’s growth. Prune these early spring to allow for bud development the same year. Prune evergreens to reduce size & increase density cutting back about 1/4 of the branches a year to an interior group of needles. Trim a balance of branches to just above the new needles. Inspiration: Social Media is wonderful for inspiring novice and seasoned gardeners alike. Don’t forget to take a look around you though. You’ll find magnificent gardens locally at The Cincinnati Zoo & Botanical Gardens, Spring Grove Cemetery and Arboretum, and the Krohn Conservatory. You might even take a gander at your neighborhood landscapes to find ideas you can “borrow”.